Nothing will wear out your tyres quicker than uneven wear. Not only will it cost you money to replace tyres before you should, uneven wear can be an indication that something else is wrong with your vehicle. The most common cause of uneven wear is poor wheel alignment. Hitting curbs, going over speed bumps and driving through pot holes can all contribute to your wheel not being properly aligned. When you hit a curb, for example, the wheel gets pushed out of alignment with the one on the other side. This means that they are not quite pointing the same way resulting in one tyre being dragged slightly along the road. While driving, you can detect poor wheel alignment because the steering wheel will slightly pull to one side or the other. Not only will this wear the tyre out very quickly on one side, it is also bad for fuel consumption. Fortunately, this is a common problem that is easily fixed with a few adjustments. Another problem that causes uneven tyre wear is over/under inflation. This usually occurs when people find that their tyres keep going down and they keep pumping them up. If you tyre is going down then it has a hole in it. Getting a puncture repaired is much cheaper than buying a new tyre. Running your tyres under-inflated will not only wear out the edges of the tyre on the outside, it can cause damage to the lining of the tyre inside. 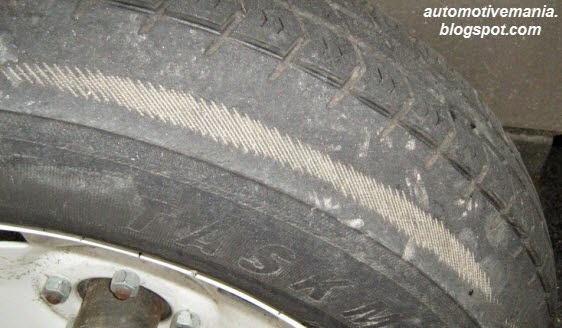 Damaged lining is fatal to tyres. They will need replacing. Similarly, running them over-inflated causes them to wear right down the middle of the tread, making them illegal and thus, will need to be replaced. Random patchy looking tyre wear can be due to faulty suspension. It can also be due to wheel problems such as buckling. Either way, these problems can be dangerous as well as costly if not sorted out. Therefore, check your tyres when ever you think of it and stop these problems before they become a big expensive issue.